The first picking of brinjal-sarang can be done within 70-75 days of transplanting. 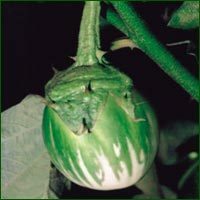 The fruits that are obtained are round, oblong, thorny, light green in color with blackish purple strips. The fruits are also uniform in size and color. The hybrid brinjal-sarang is excellent in taste and is fit for cultivation all the year round. This category is ready to harvest within 70-75 days after transplanting. The fruits, branches, leaves and calyx of the brinjal -vikas are thorny and the fruits so produced are round oblong, dark green in color with white strips at the bottom. The average weight of the fruit is 85-115 gm and is suitable to be cultivated in all seasons. The hybrid seed for brinjal tapiraja is ready to harvest within 70 to 75 days of transplanting. The plant of the brinjal erects with extensive branches and is thorn less. The fruits so produced are light green in color with white strips at bottom. Per plant yields 20-25 fruits of 300-400 gm each. The fruit bears excellent taste and are in huge demand in hotels and malls for making man brinjal delicacies. It can be cultivated in all the seasons. 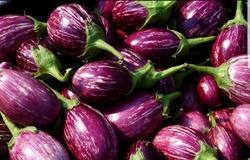 Looking for Brinjal Seed ?